Robert Fitzroy The captain of the HMS Beagle which sailed around the world with Charles Darwin aboard as naturalist. Robert FitzRoy was born at Ampton Hall, Suffolk, England, on 5 July 1805. Through both parents he was connected with the upper echelons of the aristocracy. From his first ship, the Thetis, FitzRoy was appointed in August 1828 to the Ganges as flag lieutenant to Rear Admiral Sir Robert Otway, commander in chief of the South American station. Three months later FitzRoy was given his first command, the Beagle, which was carrying out the survey of the coasts of Patagonia, Tierra del Fuego and the Straits of Magellan. 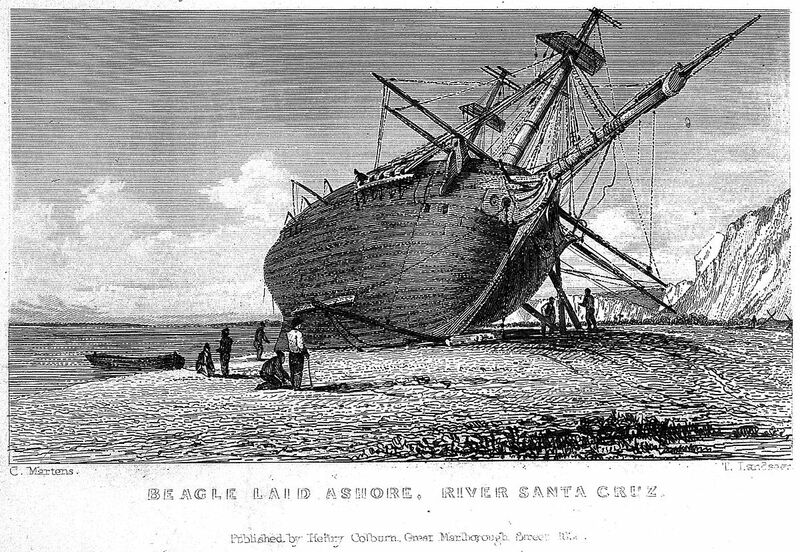 After returning to London in 1830, the Beagle was assigned to continue this survey and left England in December 1831, carrying the young Charles Darwin as naturalist. On this second voyage FitzRoy visited the Cape Verde Islands, the South American Coast, the Strait of Magellan, the Galapagos Islands, Tahiti, New Zealand, Australia, the Maldives, and Mauritius before returning to England. The voyages of the Beagle established FitzRoy as an excellent navigator, a sound surveyor and a man of science. He was the first to record much of the language of the Fuegians and was partly responsible for the establishment of the first, unsuccessful, Fuegian mission. He had formed and expressed views on the government of native peoples. Probably on 8 December 1836 Robert FitzRoy married Mary Henrietta O'Brien, daughter of Major General Edward James O'Brien; they had three daughters and one son. On 22 April 1854 in London, after the death of his first wife, Robert FitzRoy married Maria Isabella Smyth, daughter of a FitzRoy cousin; they had one daughter. FitzRoy began a brief parliamentary career in 1841, as the Tory member for Durham. But on 7 April 1843 he was appointed governor of New Zealand but was dismissed in 1846 largely because he contended that Maori land claims were as valid as those of the white settlers. In 1854 FitzRoy became the head of the British Meteorological Department where he was a pioneer of weather forecasting. He also pioneered the printing of a daily weather forecast in newspapers. FitzRoy virtually invented the term 'forecasting' and did much to initiate the wide-ranging processes of a weather bureau, to the great benefit of those on land and sea alike. He devised a storm warning system that was the prototype of the daily weather forecast. He invented a cheap and serviceable barometer, named after him. He was undoubtedly overtaxed physically and mentally (his staff numbered but three), and during severe mental depression took his own life on 30 April 1865 at Lyndhurst House, Upper Norwood, Surrey, England. On its second expedition (1831-1836) the HMS Beagle, captained by Robert Fitzroy, carried on board the young Charles Darwin as naturalist whose findings on the Galapagos Islands, during the survey, sparked his theory of evolution. In his monumental Origin of Species that was published in 1859 Darwin presented his evidence for the descent of all life from a common ancestral origin. Like any expedition, there were space limitations. The Beagle was not an exceptionally large vessel by any means. Measuring only ninety feet in length, she carried a crew of 74 people, including the Captain, three officers, the crew, a doctor, an artist, and the naturalist. Darwin shared the poop cabin (at the back of the ship) with two officers. Their space was so cramped that Darwin had to remove a drawer each night so that he would have room for his feet. David Likely (see links) tells the story of how the ship's Captain Robert Fitzroy almost refused to let Darwin sail because his nose did not appear to be that of a man with character. Darwin had to get testimonials that he was suitable for dining at the Captain's dinner table. Apparently, Darwin and the Captain, a fundamentalist Christian, didn't always see eye to eye (Darwin was once banned from the dinner table for several days), which has led some to speculate that this relationship even further hardened Darwin against religion. Fitzroy was a staunch believer in a literal interpretation of Scripture; sought data to confirm the biblical account of creation and appealed to Darwin to recant his theory but to no avail. He felt guilty his expedition was used to undermine Scripture. During the five years of the Beagle voyage Fitzroy and Darwin survived storms, earthquakes, disease, encounters with hostile Indians, gauchos, witnessed slave-torture, and fled from military dictators.